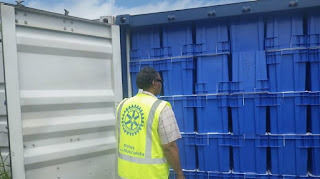 Rotary Club Nuku'alofa, in cooperation with the Emergency Response Kit initiative supported by Rotary Clubs in New Zealand, have placed a container with 298 kits at Scenic Hotel in Fua’amotu. The kits are valued at NZ$178,000. There are now two containers in place under the management of National Emergency Management Office for distribution in emergencies. An initial container was used in Ha'apai after Cyclone Ian. These are to support families through the first days after a disaster. With a kit and a little ingenuity, a family is able to construct basic shelter, keep themselves protected from the elements and utilise the immediate survival items that are included. The boxes are packed by Rotarians and their supporters from the combined clubs in NZ. Each holds over 60 items likely to be needed by a family in an emergency situation, including: two weatherproof tarpaulins for immediate temporary shelter using the hammer and nails provided; a folding shovel assists with trenching and ground works: fishing kit, hunting knife, machete for wood gathering, a cooking grate and Bombay pot in which meals can be prepared, and bowls and mugs for serving. Basic clothing and underwear for family members and bed covers to maintain warmth. A medical pack of essentials such as water purifying tablets, soap, pain killers and antiseptic cream. The Emergency Response Kit is packed in a 78 litre plastic container, which when emptied, can be fitted with a tap included, and used to treat drinking water for family use.